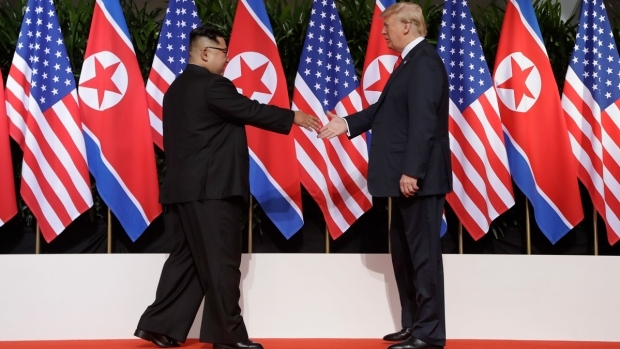 This June 12, 2018, file photo shows President Donald Trump meet with North Korean leader Kim Jong Un on Sentosa Island in Singapore. "The United States is going to continue to keep pressure and sanctions on North Korea until we see fully and verified denuclearization," Sanders said. 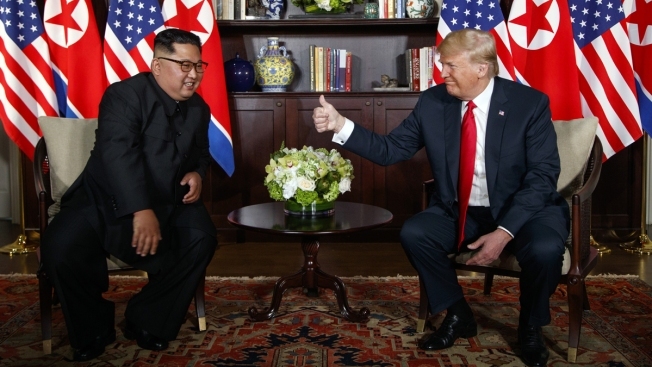 "We've had very good steps and good faith from the North Koreans in releasing the hostages and other moves. And so we're going to continue those conversations and the president looks forward to the next meeting." Independent analysts are highly skeptical that North Korea will easily abandon a nuclear arsenal constructed in the face of deep poverty and probably seen by Kim as his only guarantee of his government's survival. But Retired Gen. Vincent Brooks, former U.S. commander of American and allied forces in South Korea, told "PBS Newshour" that he believes Kim is serious about getting rid of his nuclear weapons. "I do. I think that the dance is going to be very important here, though, as we think about how we go from where we were to where we all want to be," Brooks said. "First, we ought to take him (Kim) at his word. And it's not an easy thing to accept, especially given the track record of North Korea. "But this is a new leader in North Korea ... and, indeed, there's evidence that he's serious about committing to what he said. For example, we've now gone 415 days without a strategic provocation, test or demonstration. I think that's a signal by itself that Kim Jong Un has moved in a different direction."